70mm frame from the Showscan demonstration film: "New Magic". Image from the Showscan brochure. The houselights dim. The screen comes alive with a scratchy print of a documentary about a large fireworks display. At the rear of the theater, the audience hears projection noises. 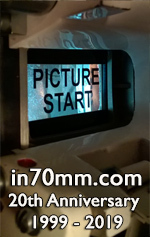 The film goes in and out of focus. The sound is bad. Finally, the film jams in the projector and burns. 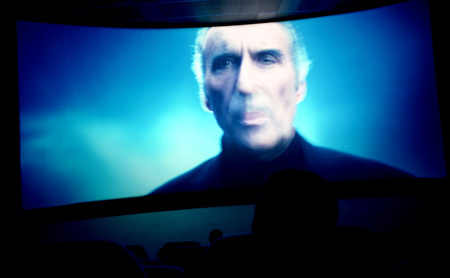 In a harried attempt to save the presentation, Jeremy (Gerrit Graham), the film's projectionist, goes behind the screen to find a back-up print of the film. Addressing (he audience with his apologies, he fumbles the second print as well, strewing the floor with celluloid spaghetti. Fearing for his job, he is determined to make a go of it and so uncovers a mysterious console. It is an "illusion" device invented by his employer, a magician named Mr. Kellar. Jeremy swears the audience to secrecy and proceeds to demonstrate the device, which he obviously knows little about. Recklessly pressing buttons on the console, he activates the first illusion, a panoramic aerial sequence that transports the audience to soaring heights over icy mountains. As Quickly as it appears. It vanishes. Jeremy presses another button. This time, an open road stretches before the viewers as they are placed in a high speed sports car careening around hairpin turns. Again, the illusion vanishes, but Jeremy is delighted. He enthusiastically calls up illusion after illusion, until he characteristically goes too far for one more thrill. The machine shuts itself off. The ground begins to shake. The building trembles. Jeremy is terrified. Is it an earthquake, or just another illusion ? 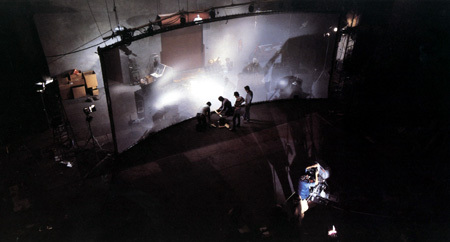 From the filming of the first Showscan demonstration film: "New Magic". Image from the Showscan brochure. Jeremy cowers for fear his angry employer will miraculously appear and discover his careless tampering. Instead, a steel door opens before him revealing an unusual room filled with exotic mechanical and electrical paraphernalia—a guillotine, a giant spider in a web, an old cathedral clock, lightning machines crackling with bolts of electricity, and modern-day robots along with a talking ventriloquist's dummy and a self-activating puppet of an archer with bow and arrows. True to form, Jeremy lets his curiosity get the best of him as he explores the room. He tries to turn on a lump- it vanishes. He looks into a mirror, instead of glass, it is made of water, and suddenly a whale jumps out! Jeremy becomes even more frightened when he hears a siren and a police car crashes through the room. In the next instant, all is intact. Jeremy confidently concludes that these are just more of Mr. Kellar's tricks, so he foolishly puts his head in the "trick" guillotine. He gets stuck, as the archer puppet fires an arrow at the rope that holds the blade. 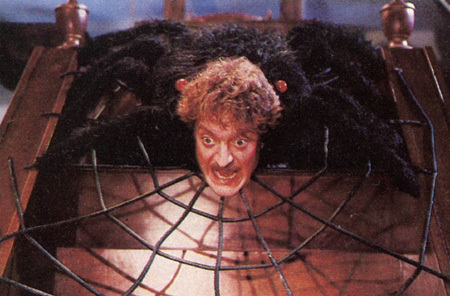 The blade falls, and Jeremy's head turns up on the body of the giant spider. Projectionist Jeremy (Gerrit Graham) in trouble. From the Showscan demonstration film: "New Magic". Image from the Showscan brochure. Another illusion? Yes, but Jeremy has had enough and begs the absent Kellar to stop, instead, a menacing shadow appears on the screen and raises an ominous knife. Suddenly, a real knife appears slashing the screen and cutting it down. With a bolt of lightning, the booming voice of Mr. Kellar (Christopher L ee) speaks to the trembling Jeremy who pleads for mercy. With another bolt of lightning, Kellar transforms Jeremy into ShowBiz' mascot Billy Bob Brokali. Anxious for Kellar's approval, Jeremy promises to be the best Billy Bob ever as Kellar orders him out of the theater. Suddenly, Kellar appears in person and orders up the promised fireworks—not the crude, scratchy image seen at the beginning, but an elaborate display with all the brilliance and clarity Showscan can offer, and in full six-channel stereo. Once the fireworks show is over, Mr Kellar addresses the audience again explaining the secret of his miraculous "illusion device," the Showscan process itself. Kellar approaches the camera, until only his eyes fill the giant screen as he promises more and greater Showscan spectacles to come.